It is 25 years since the late Jack Mustardé founded this Charity and initiated the training of surgeons with the aim of establishing a much needed Reconstructive Surgery and Burns Service in Ghana. In that time, the unit at Korle-Bu teaching hospital has grown and flourished to become the highly regarded and entirely self-sustaining training hub that it is today. In February 2001 the Kumasi Burns and Intensive Care Unit (BICU) was opened at Komfo Anokye Teaching Hospital in Kumasi. In 2009 the new Accident Unit was opened at KATH and provides a further 4-bed ICU solely for Burns. Supported by ReSurge the Kumasi BICU has also gone on to become a training hub for the region and is a thriving 8 bed unit that performs over 1000 operations a year. Out of the 10 West African regions only 3 have a reconstructive surgery presence. 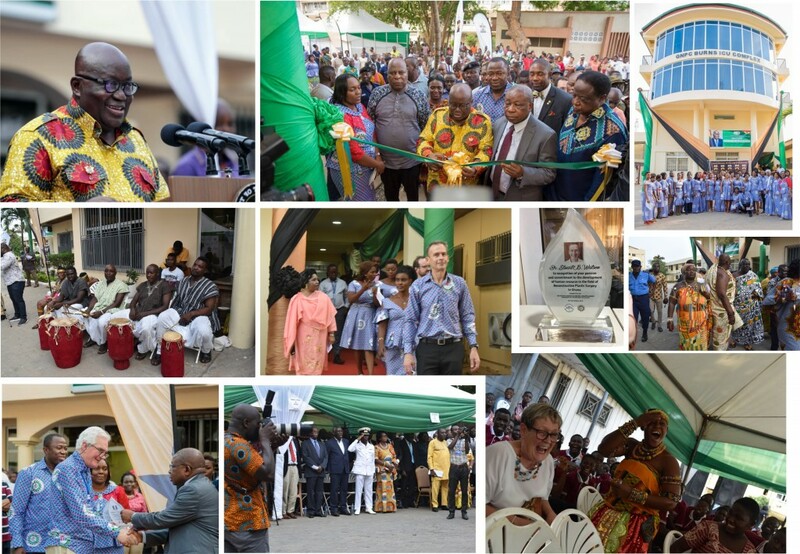 On Wednesday 5th December a new, state of the art National Burns ICU Complex, funded by the Ghanaian National Petroleum Company (GNPC) was officially commissioned at Korle-Bu’s Reconstructive Plastic Surgery and Burns centre by the Ghanaian President His Excellency Nana Addo Dankwa Akufo-Addo. To celebrate the occasion His Excellency generously donated his November salary, as a contribution to a fund set up at the Unit to support needy patients that cannot pay for their own treatment. The opening ceremony was a vibrant and uplifting affair with traditional music, dancing and great speeches given by President Akufo-Addo, the Minister of Health – Mr Kwaku Agyeman-Manu, CEO of the GNPC – Mr Kofi Kodua Sarpong, Korle-Bu Chairman of the board – Dr Okoe-Boye and ReSurge Director Mr Opoku Ware Ampomah who is also Medical Director for the Korle-Bu Reconstructive plastic surgery and burns unit. During the ceremony, Ghanaian Minister of Health Kwaku Agyeman-Manu presented Mr Stuart Watson with an award, in recognition of his passion and commitment to the development of human resources in the field of Reconstructive Surgery in Ghana. During the preceding week Mr Watson had led a team of ten volunteer surgeons, nurses, and Anaesthetists from Glasgow Royal Infirmary & Canniesburn in delivering courses in burns, micro-surgery, Anaesthetics and reconstructive flap & Noma Surgery. Joining the faculty was ReSurge Director Martyn Webster, driving force of the Charity since 1993, who was also honored with an award for his outstanding contribution to the development of Reconstructive Plastic Surgery services in Ghana. Accepted by Chairman Mr Odhran Shelley, ReSurge Africa were delighted to be honored with an award for their pioneering role and continual investment in the total development of Reconstructive Plastic Surgery and Burn Care Services in Ghana. ReSurge Africa is immensely proud of the achievements of Mr Opoku Ampomah. During the last 25 years the centre has carried out thousands of surgical operations and as the National Centre oversees the country’s 15 Reconstructive Plastic Surgeons, many of whom have been supported by ReSurge Africa throughout their advanced training and to attend specialist Microsurgery courses, conferences and seminars. In August 2018 the centre was voted Best Specialist Health Centre of the year by the West African Clinical Alliance and it is now an important partner in the ReSurge Africa training programme, which is primarily focused on replicating this successful model in Sierra Leone. ReSurge Africa, with the help of Korle-Bu, Canniesburn and our partners in India are currently training the Surgical team who will establish Sierra Leone’s first Reconstructive plastic surgery and burns service. This team is made up of Surgeons, Physiotherapists, Anaesthetists and Nurses.